High dynamic range allows the camera to capture range of light similar to the human eye — but done wrong, that extreme range of light can be a literal eye sore. Finding overdone and entirely fake HDR images online is as easy as finding a selfie stick at a tourist trap (or a fanny pack, back in the 90s). 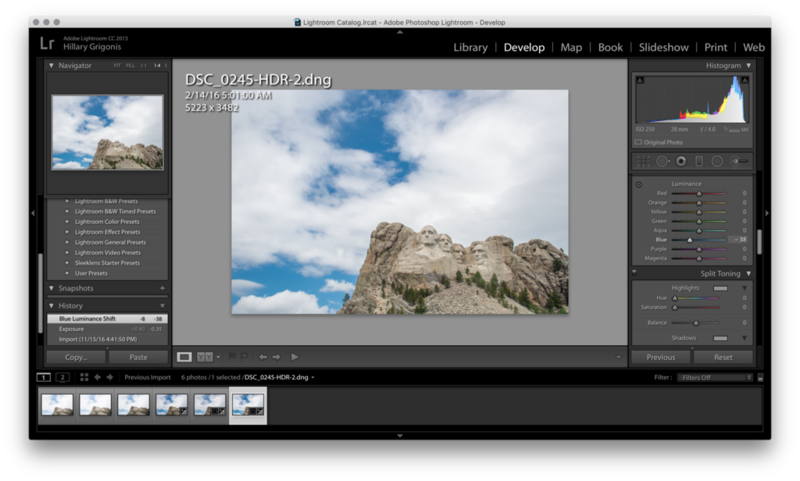 But, when I recently visited one of those tourist traps to shoot some well-chiseled historical figures, I knew I needed HDR if I wanted to make the bright blue skies stand out from the well-known landmark of Mount Rushmore. I shot Washington, Jefferson, Teddy and Lincoln with the Nikon D500 in RAW mode, generating four images between -1 EV and +0.7 EV. Since I traveled there on two wheels, I didn’t have the space to pack my tripod and shot the images by end, so the files don’t line up perfectly. I also adjusted the exposure between each shot manually instead of using auto bracketing, so the shots were spaced a bit farther apart. The performance of any photo software is going to depend on the size of the files and the computer given the task. Each of those four files I had to work with is about 26 megabytes. I tested all three programs on my 2015 MacBook Pro that, before the launch of the touchbar options, was the fastest laptop Apple produced. 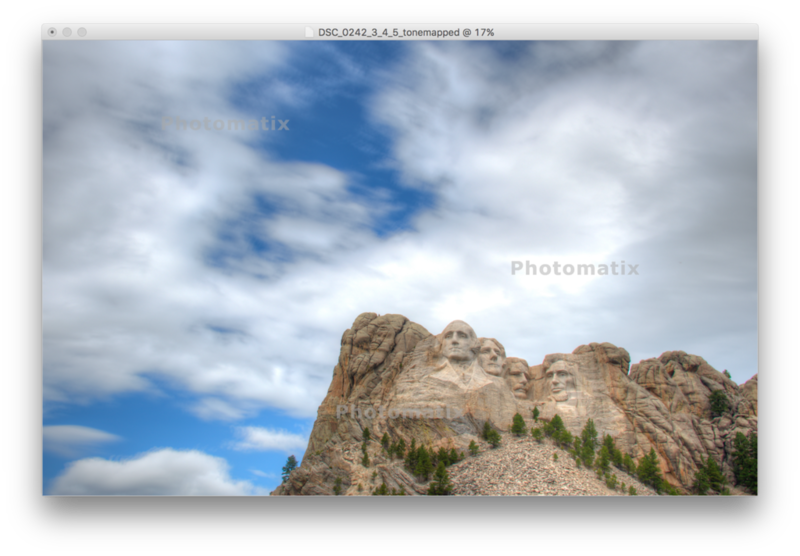 Get a free trial of Photomatix and try it out for yourself. Photomatix is the original HDR photography software, launched in 2003. With a long history, Photomatix is a well-known option among photographers. While the program may have the longest history, it doesn’t boast the same amount of options as Aurora or Lightroom. It does the deed though, merging both RAW and JPEG files. After opening the program, users select their files to merge, or the platform can tone map a single RAW file as well. While all three programs have presets to adjust things like the exposure, Photomatix also has a handful of presets to get the best alignment from your shots — including three handheld options. Once the images merge, the program displays several different presets on the right. Few of the presets actually produced an image that looked, to the untrained eye, that it could have came straight from the camera, but Photomatix also includes six black and white presets, where Aurora only includes one in the initial download. After the preset, there are a few sliders on the left for customizing how the images merge — including strength, color saturation, tone compression, detail contrast, highlights, gamma and a handful of others. Lightroom veterans won’t recognize many of those terms, but one corner of the program is dedicated to explaining what each feature does, so the learning curve isn’t extraordinarily high, but Adobe users will have to adjust to the different terminology. Photomatix doesn’t have as many editing options as Aurora, but where the oldest HDR software shines is in speed. The files took just twenty seconds to merge and less than five seconds to apply all those changes at the end. Adjustments are nearly instantaneous, so I could see the changes I was making as I made them. By comparison, Aurora took 36 seconds just to merge the files, and each edit took a few seconds to pop up in the preview. Lightroom took about 47 seconds to merge the four images and generate a preview. The difference isn’t huge with four files and a quick computer, but the gap between the two would likely lengthen the more files that your merge or the older your computer is. The number of editing options and presets from Photomatix was less impressive than the options from Aurora, but Photomatix was the first one to cross the finish line. Photomatix is likely a good option for users looking for quick and simple mergers. Download a free trial of Aurora HDR for Mac and try it out for yourself. If Lightroom was only for HDR, it would probably look a lot like Aurora. The platform includes several editing options — and they use the same terminology as Adobe, so it’s easy for Lightroom users to adapt to the program. 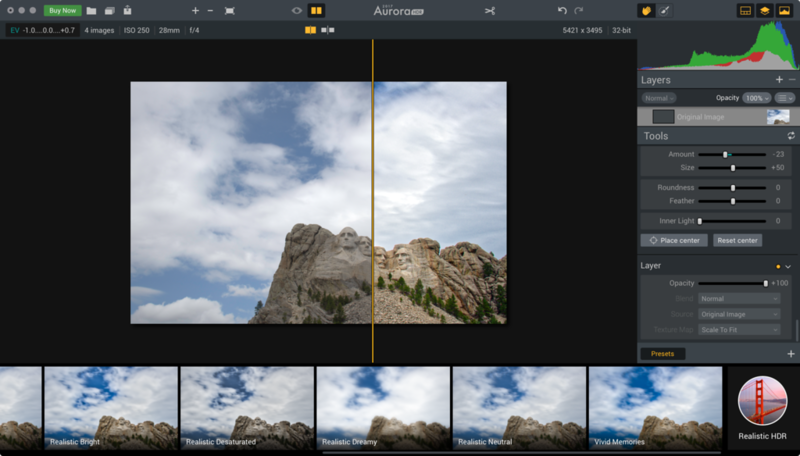 Aurora first merges the photos — users can choose whether to auto align images, remove ghosting or reduce noise, but each option slows down the process. Once merged, the program shows a variety of different presets, a handful of which are realistic while the majority are for specific types of shots. 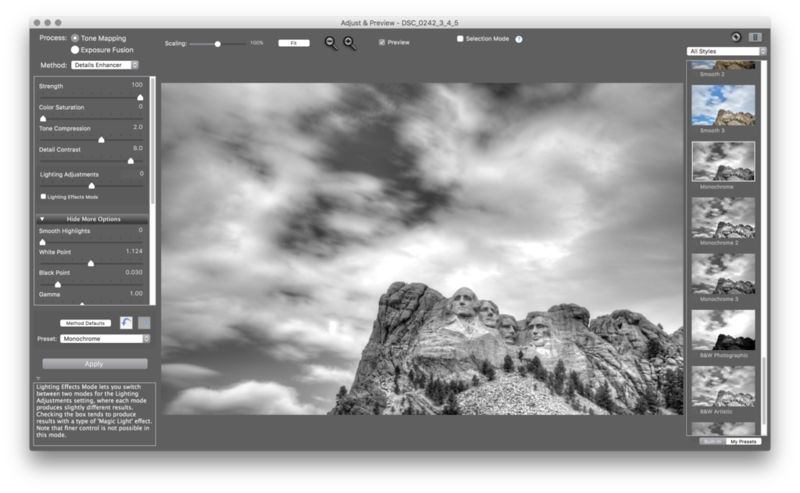 While the program uses more presets than Photomatix, users can download even more online. Once a preset is selected, the lefthand set of panels (which feels very similar to Lightroom’s layout as well) offers different sliders automatically adjust to that preset, much like using a preset inside of Lightroom. That means the effects are easily adjusted, and users can even save their adjustments as a custom preset. Aurora’s panel of tools includes much of the same options that Lightroom uses, only Aurora appears to apply some of those effects before a complete merger, allowing you to work with the data from all four files. Basically, instead of merging the files and then going in to make adjustments like in Lightroom, you adjust the files and then merge them. That allows for a few tools like the HDR Denoise and HDR Detail use data from all four files. Most of Aurora’s tools have similar options in Lightroom, but the polarizing filter, a new addition to the program, isn’t one you can find on Adobe products yet — and it’s actually rather impressive. While extreme use of the polarizing slider will produce that fake HDR look, the tool actually did a pretty nice job of enhancing the blues in the sky. Aurora also includes a handful of tools that allow users to selectively edit specific portions of the image. A brush tool allows users to select different areas — this feature carries out the same tasks as Lightroom’s brush tool, but it doesn’t feature the auto mask that automatically recognizes edges for more accurate selections. A gradient mask, to apply an edit to just the skyline in an image with a straight horizon, for example, is also included. Luminosity masking allows for similar edits, but selects portions of the image for you by selecting a small range of the tone curve at once. While using Aurora is much like using Lightroom, there’s a few hidden features that tend to be more similar to Photoshop’s tools. Layers allows users to create adjustment layers or even duplicate one of the original images in the merger for more customization over the final results. While merging the files at the end introduces a few useful tools, it also makes Aurora one of the slower options. Along with taking nearly twice as long to merge compared to Photomatix, previewing each change takes a few seconds as well. (Lightroom, though, was noticeably slower at merging the files, taking the longest at 47 seconds). While Aurora is the new kid on the block, the program is rather impressive. Since it can apply changes before merging the files, unlike Lightroom, users have the option to use the information from all images for tasks like reducing noise. The digital polarizing filter is also rather impressive. While the extra options are more for newbies to learn, Lightroom users will feel right at home with similar terminology and even a similar layout. Aurora wouldn’t win any races, but it does get some serious points for versatility. Get a free trial of Adobe Creative Cloud's photography plan and try it out for yourself. Unlike Photomatix and Aurora, Lightroom isn’t a one-trick program. 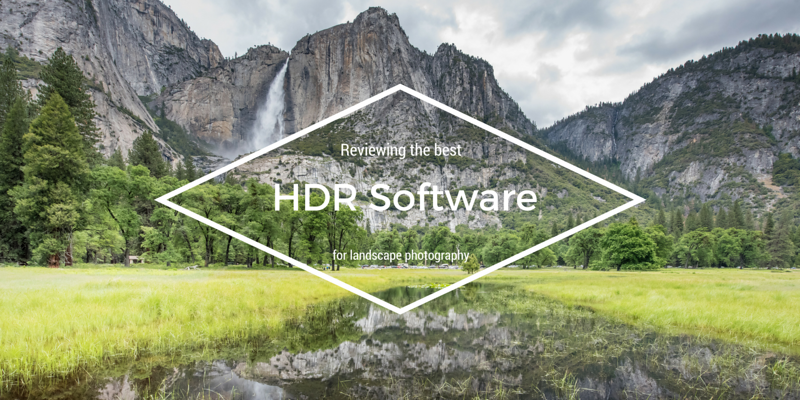 As a program that edits single photos, HDR and even panoramas, users can turn to Adobe’s popular RAW editor for more than just HDR. But how does the program’s features stand up to a dedicated HDR platform? 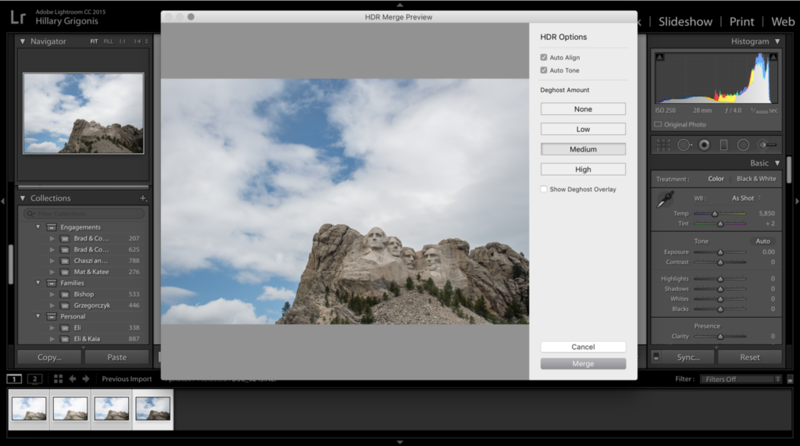 Merging an HDR in Lightroom is as simple as selecting the photos, then right clicking and choosing “merge in HDR.” A dialog box pops up that offers different controls for merging those photographs. While Lightroom has the most options that work with every type of photo, it doesn’t have nearly as many options for merging HDR. In the HDR window, users can choose from low, medium and high merge settings, as well as whether or not to auto align the images. Once the files merge, the image can be edited like any other photograph, which opens up possibilities for adjusting exposure, white balance and more. But while Aurora uses the information from all merged files, a majority of Lightroom’s adjustment options only work with the image after the merger. 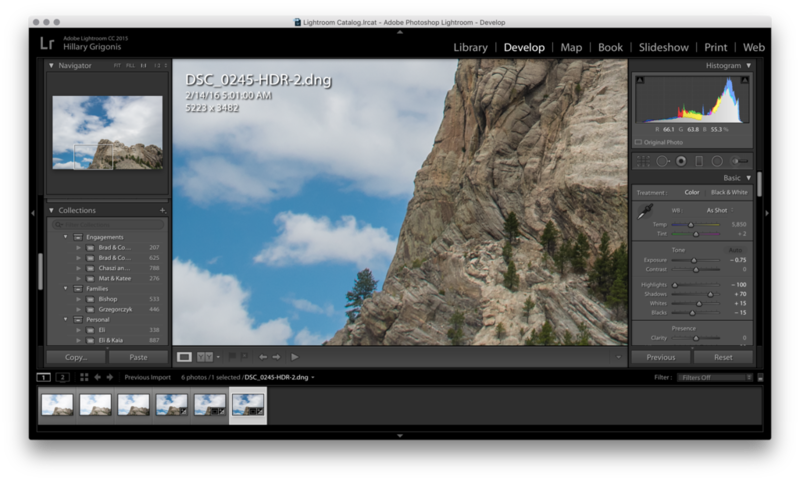 That means Lightroom is working with less data once the files have merged, while a handful of Aurora’s features, like the HDR denoise, works by taking the information from each file, instead of reducing noise from a single file after the merger. 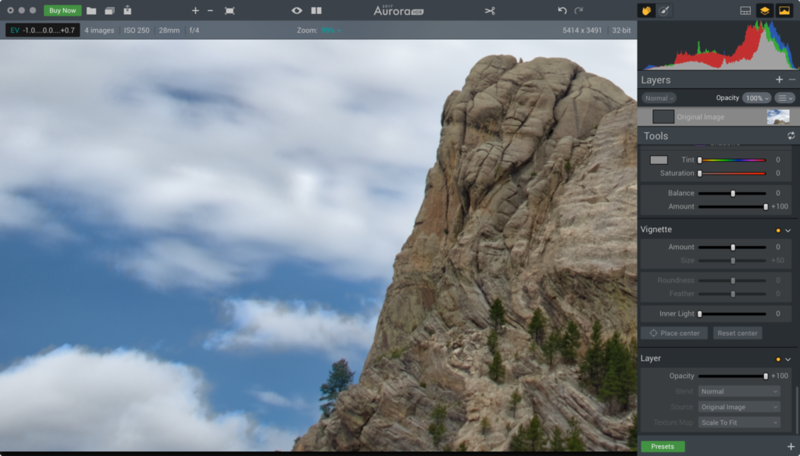 Aurora’s digital polarizing filter also isn’t a Lightroom option. But here’s the thing — while Lightroom doesn’t have the same level of edits to use while merging a photograph, Lightroom created the most realistic results. Since my images were shot without a tripod, I used the auto align feature from all three programs. All three correctly aligned Mount Rushmore in the merger, but neither Aurora or Photomatix perfectly aligned the clouds. Moving objects are notorious for creating issues in HDR photos, which includes the clouds. Using the auto-bracketing feature to take the images closer together would have helped, but Lightroom’s ability to remove significant cloud ghosting is impressive. Aurora and Photomatix made that cloud movement look like the sky in a long exposure photograph (even with Aurora’s ghost reduction on). That’s not necessarily a bad thing if you’re aiming for that long exposure look, but Lightroom’s auto align feature was much more accurate — so you could potentially freeze those clouds in place or go back in and mimic a long exposure by blurring the sky later. If you base the success of each program on the ability to create an HDR image that looks like it could actually exist in real life, Lightroom is the clear winner with a better auto align feature. Because you are editing a RAW file, you can use the same tools Lightroom has for every image to adjust the image even further and tweak the results. 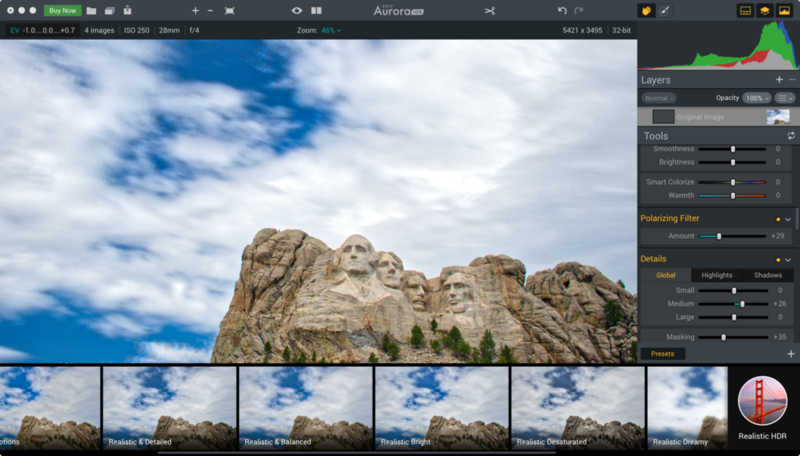 Both Photomatix and Aurora HDR retail for $99. Adobe Lightroom comes bundled with Photoshop for $9.99 a month, but the subscription plan often turns off buyers who would rather buy the program outright and use it for a few years instead of seeing a monthly charge. Photomatix is the fastest option of the bunch, which may appeal to photographers that want to get lots of HDR work done quickly. The amount of adjustments to apply to the individual images as they merge (not options to adjust a merged HDR file) sits in between Aurora and Lightroom. 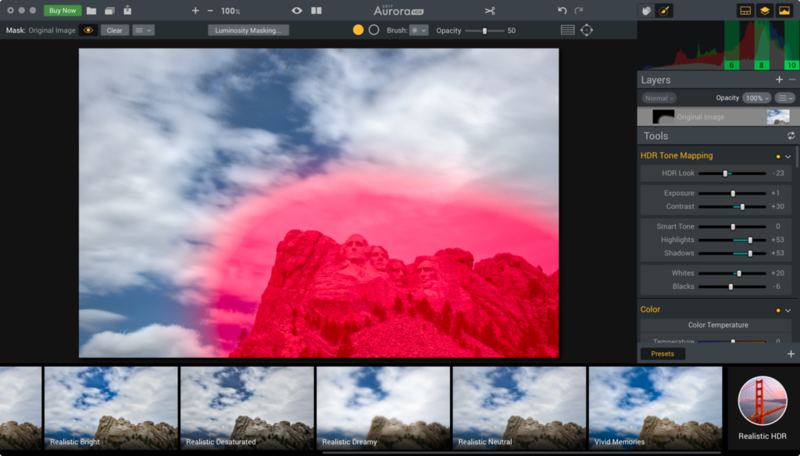 Aurora has an excellent assortment of tools — and the most options for customizing how the individual photos merge with tools like noise reduction that take data from each individual file instead of the pixels in the merged image. The digital polarizing filter tool is impressive and is almost worth the $99 by itself. When it comes to having the most control over how HDR files merge — whether you want a natural look or other-worldly detail — Aurora is an excellent option. But, only Lightroom’s auto merge feature was able to eliminate the difference in the movement of the clouds in the test photos. While the HDR merge feature only has three different settings and an alignment tool, Lightroom’s slew of editing options after the merge produces solid, realistic results — including several tools to apply edits to specific portions of the image. I preferred the results of the HDR photo merge from Lightroom because the program was able to eliminate the ghosting caused by the movement of the clouds. For someone (like me) who only does occasional HDR merges and needs a tool that can do more than just HDR, Lightroom is an easy choice. Aurora, however, could very well be a nice addition for avid landscape photographers. Aurora has a handful of tools that use data from all the individual files, rather than the merged file, boasts options very similar to Lightroom edits, and offers an impressive polarizing tool. A plug-in allows Lightroom users to easily jump between the two platforms. While Photomatix was the fastest option, the program is listed for the same price as Aurora, which has many more tools, making it a much less logical choice. Photomatix is the quick merger, Aurora HDR is the most customizable — and Lightroom is the most accurate at eliminating ghosting and getting a scene impressively close to the way you remembered it.